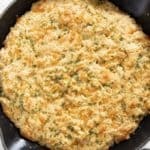 Cheesy Garlic Skillet Bread is so easy to make with drop biscuit dough in only 30 minutes! This cheesy, mouthwatering, bread is perfect with any meal! Preheat oven to 325 degrees. Prepare a 10-12 inch cast iron (or other ovenproof) skillet with butter, set aside. In a large bowl whisk together the flour, baking powder, garlic powder, sugar, and salt. Add the melted butter, milk, and shredded cheddar to the batter and stir just until moistened. Place the dough in the prepared pan and push down into an even layer, filling the entire pan. Bake in preheated oven for 20-25 minutes until lightly golden on top and cooked through. In a small bowl whisk together the melted butter, garlic powder, parsley, and salt if using. Brush over hot bread as desired.